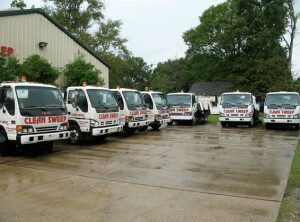 1-800-SWEEPER Partner Profile: Clean Sweep, Inc.
1-800-SWEEPER Blog 1-800-SWEEPER Partner Profile: Clean Sweep, Inc. The year was 1990 when Clean Sweep, Inc. began in Baker, Louisiana (a town in east Baton Rouge). “We started sweeping parking lots using a dust pan and broom,” says co-founder, Bridget Burge. “Later we added a $100 Wal-Mart lawnmower hoping to mow a few lawns, too.” The beginning may have been meager but today Clean Sweep is a company to admire. It all started when Bridget’s business partner Warren worked at UPS and was threatened with a possible strike. “What would we do if there was no income coming in?” Out of concern of a possible job loss, the sweeping company was created. Later, in a brilliant business move spurred by fulfilling customer need, Clean Sweep added concrete and asphalt repair to their repertoire. Many of the U.S. chemical companies operate along the Mississippi River and you can give a big thumbs up to Bridget, Warren, and company for the industrial sweeping jobs they perform for these large chemical and oil companies. Clean Sweep keeps a lot of toxic waste from entering the water system in the southeast. They also offer sweeping services for construction sites and warehouses. “In Louisiana it’s become very difficult to find good employees that show up and do quality work. That’s one of our biggest concerns. A few others are the rising cost of equipment and the less than stellar economy.” That being said though, Clean Sweep will have a record high year in 2018. Still Bridget’s concerns are valid for many industries across the U.S. When asked why Clean Sweep joined 1-800-SWEEPER Bridget said, “We wanted to be part of the rebate program and benefit from the new business a membership brings. Most importantly we wanted to be part of this group of elite sweepers.” Not everyone can join 1-800-SWEEPER since there is only one partner per market across the U.S. In 2016, Louisiana experienced a “1,000 year flood” in which hundreds of thousands of homes and businesses were destroyed. “FEMA trailers were set up all over the place. The devastation was unbelievable and so many people lost everything. As a state, we are only now beginning to come back from that.” Even Clean Sweep did not come out unscathed since floodwaters ruined 7 of Clean Sweep’s sweepers. “Gregg Blair put the word out to 1-800-SWEEPER members and we started getting offers to buy machines at reduced prices to get back on our feet. 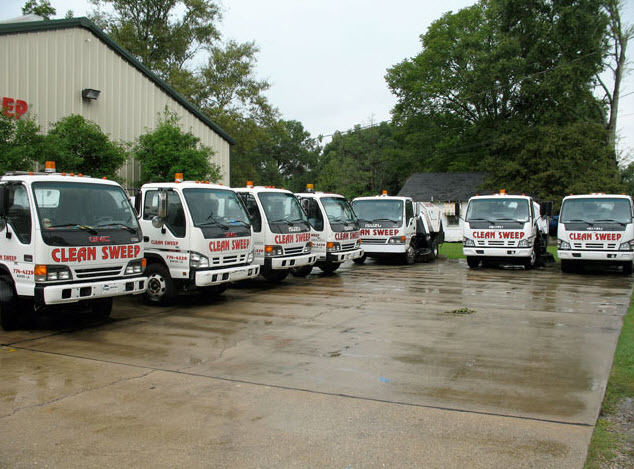 Manufacturers, particularly NiteHawk, provided help as well.” Just one more great reason to join the 1-800-SWEEPER community – for the camaraderie. Coming back from that experience took a lot, especially since Bridget was diagnosed with 2 life-threatening illnesses during that time as well. But Clean Sweep and Bridget are back to full speed and better than ever; ready for the next challenge hurled by the universe. As a life long Louisianan, you can tell by talking to Bridget that she is a survivor. Not bad for a company that started out with just a dustpan, right? Clean Sweep, Inc. was the 6th company in the U.S. to become certified through NAPSA. They are members of 1-800-SWEEPER and are founding members of WSA. This close-knit group consists of people who come together for a common goal, persevere despite life’s challenges, and believe in doing the best job they can regardless of the size of that job. Cheers to Clean Sweep in Baker, Louisiana!